Designed to for use with the Xbox One and Windows PCs, the Link can stream high-res audio to wireless self-powered speakers. 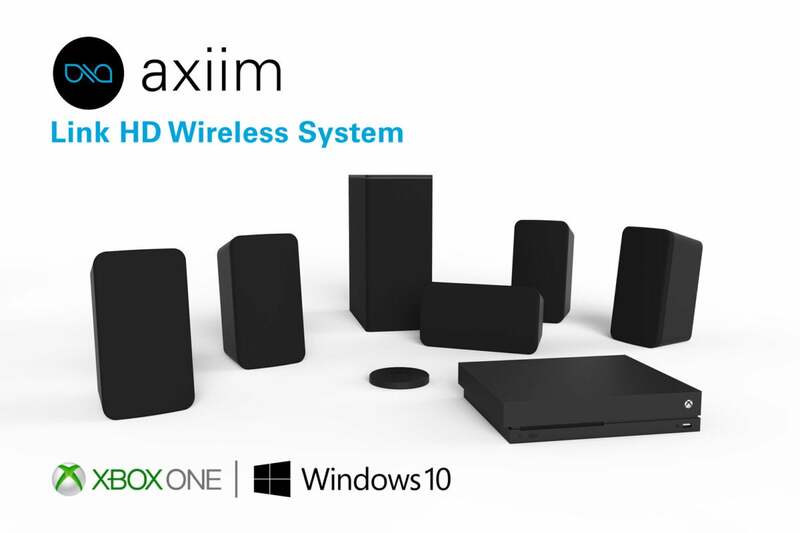 Based on the latest version of the WiSA (Wireless Speaker & Audio) standard, the Axiim can take up to eight channels of 24-bit, 96kHz uncompressed audio from the USB port of an Xbox One or Windows 10 PC and stream it to as many as eight wireless self-powered speakers. While the Link is compatible with any WiSA-certified speaker, the system transmitter will be available pre-paired with front left and right, front center, surround left and right, rear surround left and right, and a subwoofer. The only cords you’ll need to deal with are for power. The WiSA standard limits latency to 2.6ms of latency and it supports audio-to-video synchronization, which is essential to both movies and games. Remarkably, the WiSA standard also supports wireless streaming of object-based soundtracks such as Dolby Atmos (with a limit of eight audio channels). Axiim was also showing it’s new Q UHD Media Center at the show. This media hub is outfitted with six HDMI 2.0a inputs and one HDMI 2.0a output with ARC support. It can stream audio from Bluetooth sources, but it also has a gigabit ethernet port and an 802.11ac Wi-Fi adapter, four USB 2.0 ports, and even an eSATA port onboard. With all of those options, you should be able to stream music and video from any source you can think of. In a meeting with WiSA president Tony Ostrom, Ostrom listed Harman, LG (OLED TVs), Bang & Olufsen, Bose, and Klipsch as just a few of brands offering WiSA-compatible audio products.